Facebook is making an announcement later today that we have heard could do with Instagram, its very popular photo app, getting a video service. If true, Facebook would be entering a crowded market — but one that is nevertheless ripe for the picking, with no single app yet to achieve more than one-tenth of a potential audience. As you can see, Twitter’s Vine — the newest player on the scene, launching only in January of this year — is far and away the biggest of the top-five video sharing apps. It has 10.7% of all iPhone users monthly. 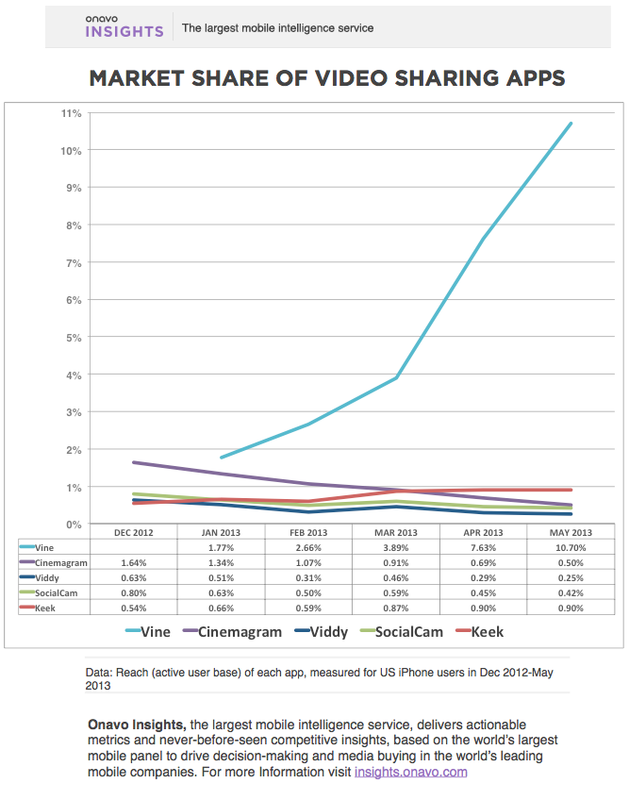 Among the next four biggest — Keek, Cinemagram, Viddy and SocialCam — as of the month of May, not one of them managed to attract more than 0.9% of users. Among those four, Keek is the only one that is not in decline, according to Onavo’s figures. But Vine’s winning share says something else: it points to how small this market is at the moment. Assuming that most people would not use more than one video app, together all four still make up less than 13% of all iPhone users. On the other hand, as a sign of why Vine specifically might pose a competitive threat to Facebook, it is also the only one of the four video apps that has been growing — and sharply, too. How much growth is left? Compare the video app proportions to those of photo apps. 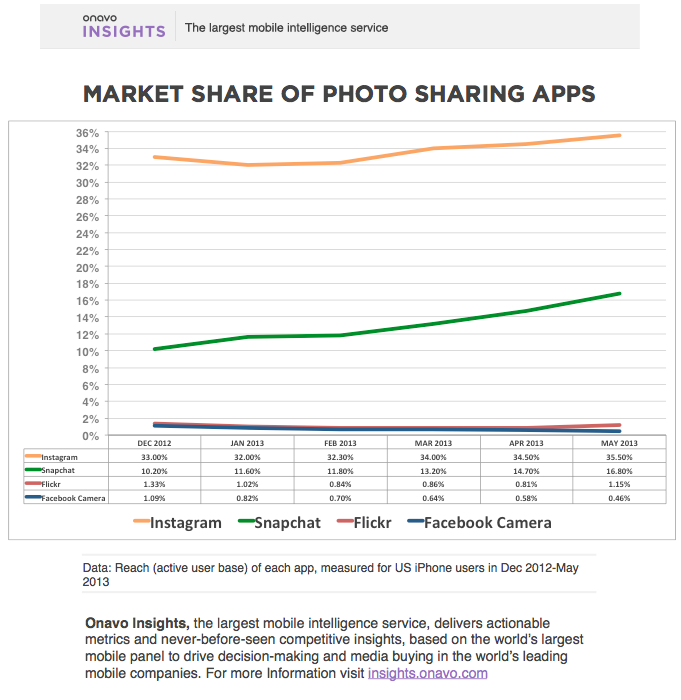 For all the video apps out there, there are even more photo sharing services, but these are reaching into much bigger proportions of consumers, and bigger overall numbers. Indeed, while Instagram looks like the clear winner now, we are still far from being in a saturated market in photo apps. Video looks small compared to photo, but when you compare photo app use to social networking app use, it also pales. Facebook, notes Onavo, is currently being used by some 72.40% of users. Twitter is in second at 27.10%, with Pinterest at 10.90% and LinkedIn at 9.65%. Video, and specifically video with a social and/or mobile spin, are hot tickets at the moment. For consumer apps and websites, video provides a route to picking up more users, getting those users to spend more time on their networks, and possibly laying the groundwork for brand-friendly advertising. For users, the rise of smartphones with good cameras, combined with a surge of interest to document our lives and share those clips with others over better and faster networks, are all contributing to a boom in the market. But it’s not at all a sure-fire formula. Lightt, a video taking, editing and sharing app that is popular with Instagrammers, is currently getting a lot of prominence from Apple in the “new and noteworthy” and “photo & video” sections of the App Store. But Lightt didn’t make the top-four cut, Onavo tells me. We’ll see if that changes. Backed by investors like Maveron; and founded by Alex Mostoufi, who also started up and then sold me.com to Apple, Lightt is still young and may yet have some more flashes left in it. Mostoufi tells me that it’s currently “doubling and sometimes tripling” its user base every week. Note: I updated the first graphic and subsequent text here to incorporate Keek, which is the second-largest video app after Vine, according to Onavo’s revised figures.